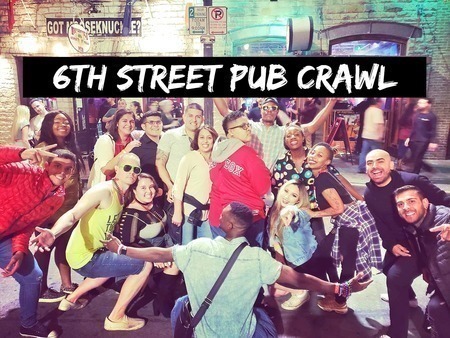 Awesome Pub Crawl Hosts, 3 Fun Hours, 4 Great Bars, $3 – $6 Drink Specials – Come Party with Austin Pub Crawl! 6th Street has Loud Music, a Rowdy Crowd, but Never a Dull Moment. Come Drink at Austin’s Top Party Destination! Starting Venue is Big Bang (415 E 6th St) on 6th Street. Look for pub crawl hosts inside. If you have trouble finding us, please ask the bouncer or bartender and they’ll help you find us. Tags: pub bar crawl nightlife 6th street.